Posted January 24, 2019 by Sarah Lederle & filed under . 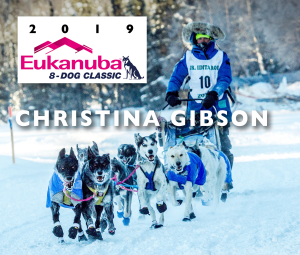 Last year Christina competed in the Junior Iditarod as well as other mid-distance races, which is her passion for the future. See her complete bio here. When are you coming to Wyoming? We left Washington yesterday (the 23rd) and are headed for Wyoming! We should arrive sometime this evening, the 24th. Originally we were planning on leaving Thursday but winter storm warnings prompted us to head out a day early. It’s been a mix! Late December/early January we were lacking in snow, but now for the last two weeks we’ve been breaking trail and on weekends local snowmobilers have been packing the trail. When do you start your training? What distances do they train once their team is fully conditioned? We usually start training mid to late September depending on the weather and how warm it is. Our average mileage for races (currently) is roughly round 100 miles, so for peak season the team should be doing right around 50 mile training runs depending on the year. What made you decide to compete at the Pedigree Stage Stop Race? As a junior musher I think that the opportunity to meet top dog mushers and see how they do things, meet and talk with the vet team, and have a chance to see how a race like Stage Stop is run (all while having fun running dogs in Wyoming! ), will be invaluable in the years to come. Thanks Christina and welcome to Wyoming!